The Roman Catholic Church must figure out what it is doing wrong in the battle for souls, because so many Catholics are leaving the church to join Pentecostal and other evangelical movements, a top Vatican cardinal said Friday. Cardinal Walter Kasper told a meeting of the world's cardinals that the church must undergo a "self-critical pastoral examination of conscience” to confront the "exponential” rise of Pentecostal movements. "We shouldn't begin by asking ourselves what is wrong with the Pentecostals, but what our own pastoral shortcomings are,” the cardinal told the gathering. •An important new document has been approved by a Vatican-Orthodox theological commission that has been working to heal the 1,000-year schism between the Catholic and Orthodox churches, Kasper told the cardinals and cardinal-designates. •Essentially, Catholic and Orthodox representatives both agreed that the pope has primacy over all bishops — although they disagreed over just what authority that is. •The development is significant since the Great Schism of 1054 — which split the Catholic and Orthodox churches — was precipitated largely by disagreements over the primacy of the pope. 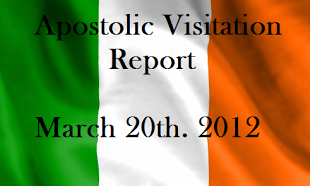 •The document marks the first time Orthodox churches have agreed there is a universal level of the church, that it has a primate, and that the primate is the bishop of Rome — the pope. 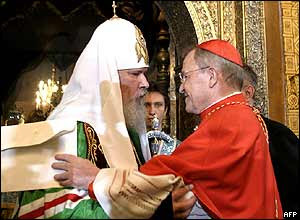 Kasper said that the Vatican's relations with the Russian Orthodox Church, in particular, had become "significantly smoother” over the past few years. "We can say there's no longer a freeze but a thaw,” Kasper said. Tensions between the two churches have been strained over Orthodox accusations that the Vatican is seeking converts on traditionally Orthodox territories, particularly in eastern Europe — charges that Rome denies.